Yes, this is another ticket, totally different than this one from last month that cost me $135. For you see, this one is for being a on cell phone in a school zone, and this one will be $275. 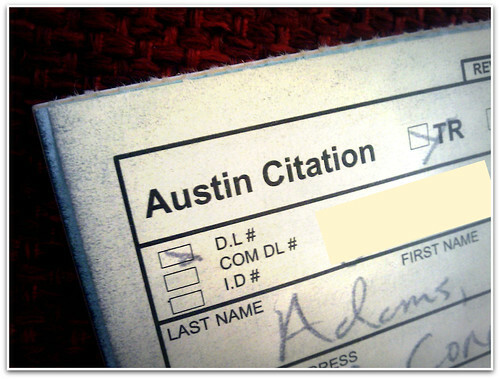 The defensive driving course is not an option since today's citation was was issued less than 90 days from my previous (alleged) infraction. Some people will say this serves me right for making fun of Nike shorts. Others will be like, "What the what? Driving while talking on your phone in a school zone is against the law?!" Yeah, that's what I said to the police man, but I got no sympathy (and really, who could blame him?). He still gave me a ticket. I cried afterward, but I probably should have cried before. Hubs is going to be very, very disappointed, and this will, for sure, raise our insurance. That's a lot of the reason why I feel so bad: it stinks that he's stuck with a higher insurance bill because of the dumb things I do. Ah, one of the few pitfalls of marriage! This will also kill my shopping budget for the next two months. I'm going to have to get creative with recycling the clothes I already own. Or I'm going to have to get a part-time job to cover all this ticket madness! Is substitute teaching hard? Is working as a temp receptionist fun? In other news, after debating a color since July, I finally finished painting one of the guest rooms today. This room will soon become Hubs' music room/ office and I hope that all my hard work will convince Hubs to not make me feel even worse than I already do about getting two tickets in less than six weeks time! 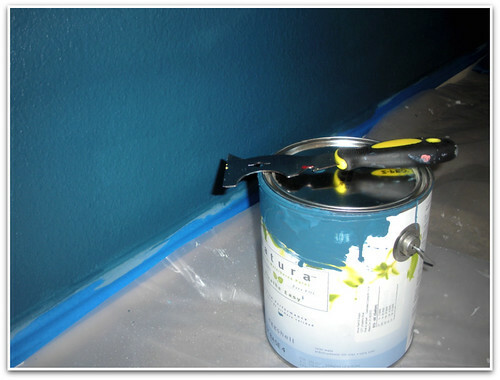 This color was color matched from Pratt and Lambert's Academy Blue. I saw it in this post on Apartment Therapy and was in love. Truly, it's lovely, and it's almost as blue as I'm feeling right now! Not that any of this is undeserved, though! Comment of the Day: Just think, a kid's crossing the road and you're on the phone and don't see him. I'm surprised the fine isn't higher. Good luck! -Taylor B.
Dear Megan Nielson, I think I just drooled a little. No Nike shorts! No Nike shorts!